In Normandy, on the Albatre Coast, the Bayen's Family welcomes you in two beautiful self catering holiday rentals. One self contained flat in the heart of Fecamp, 6 minutes walk from the ocean, the marina, the beach and the city center where you will stay in a 56 sqm furnished apartment, nice and spacious, for 4 people. The holiday rental in Yport is a fisherman's cottage 4 minutes from seaside and cliffs. 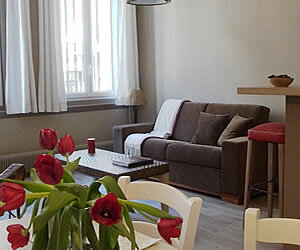 Comfortable, functional and warm, these holiday rentals are ideal for business trips, tourism or cultural stays. These furnished rentals are perfectly located to visit Normandy.